Leonardo DeCaprio, Cameron Diaz and Daniel Day-Lewis star in this epic tale of vengeance and survival. As waves of immigrants swell the population of New York, lawlessness and corruption thrive in lower Manhattan's Five Points section. 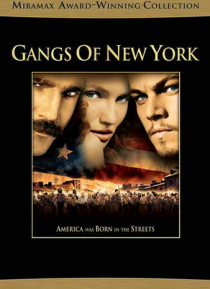 After years of incarceration, young Irish immigrant Amsterdam Vallon (DiCaprio) returns seeking revenge against the rival gang leader (Day-Lewis) who killed his fat… her. But Amsterdam's personal vendetta becomes part of the gang warfare that erupts as he and his fellow Irishmen fight to carve a place for themselves in their newly adopted homeland!